When Isaac Julien made the film Looking for Langston in 1989, the Aids crisis was at its nadir. By the end of that year, 27,408 people had died from Aids-related illnesses, including several of the film’s actors. 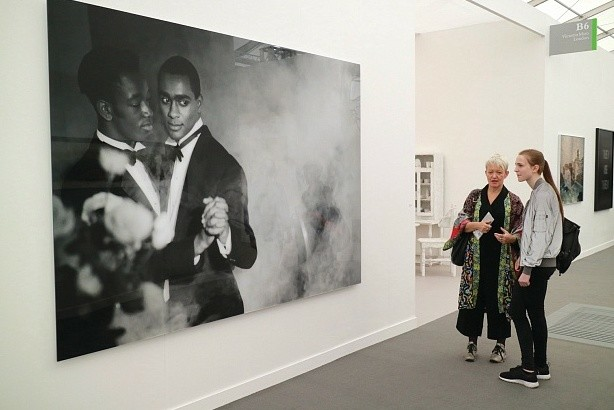 Julien’s large-scale photograph on Victoria Miro’s stand is part of a series derived from the film, which is a tribute to Langston Hughes, one of the writers at the centre of the Harlem Renaissance in the 1920s. “Isaac demonstrated a level of radicalism in making a work about gay black men in the late 1980s,” says a spokesman for the gallery. Prices for the prints, which are due to go on show at Photo London (18-21 May), range from £20,000 to £55,000.